Social network Tagged is proving that Facebook isn’t the only social network that can make money: it’s been profitable for three years running, with $32 million in revenue last year. CEO Greg Tseng explains that Tagged has been able to carve out a space by focusing on something Facebook has ignored: meeting new people. Like Facebook, Tagged lets you create a profile page and invite your friends. But the site’s main focus is meeting strangers based on criteria like location, age, and their profile picture. Tseng compares it to going to a bar with friends and meeting strangers, where typical dating services are like going to a bar alone for a singles night. This focus on dating strangers gives the site a slightly seedy edge that’s more like vintage MySpace than like Facebook. For instance, the most popular game on the site is called Pets. (Unlike Facebook, Tagged develops all its own games.) But it isn’t about virtual hamsters: Pets lets you buy, sell, and trade other people on the service. It’s strangely addictive. The site has also drawn a lot of spam — fake profiles that lead to adult sites like Web cams — but Tseng says that Tagged made a huge effort to police and cull these sites in 2010, and unique users still grew by 20% during the year, to more than 100 million. Revenue is split evenly between advertising and subscription fees from about 10,000 VIPs who pay $20 a month for advanced features, like seeing who has checked out their profile. So what happens when Facebook decides to get into the dating game? Tseng doesn’t really worry about it, saying “it’s not really in their DNA.” Facebook is more concerned about mapping the existing social graphs of its users as accurately as possible, as well as building a massive platform for other companies to add social functions to their own Web sites and services. He’s more concerned about dating startups that use the Facebook platform like Zoosk, AreYouInterested.com, and DateBuzz (formerly called Wings) and new mobile dating players like Skout, Flirtomatic, and WhosHere. To stay ahead of these competitors, the company plans to double its workforce in 2011 to about 100 people. 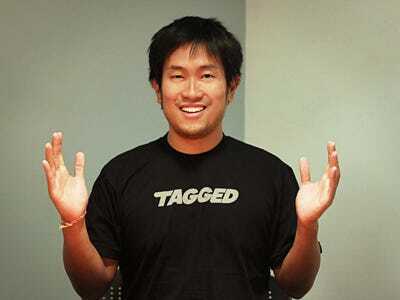 Tseng is focused on improving Tagged’s mobile story — an updated iPhone app and new Android app are being announced next week — as well as adding more social-focused games like Pets, and real-time communication like instant messaging (the most commonly requested feature) and possibly video chat.